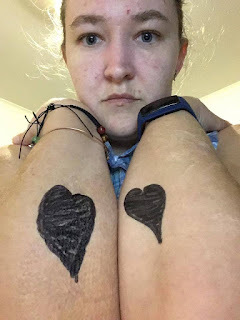 It's time to revive this blog, and I'm going to do it by talking about the #HeartOnMySleeve movement. If you haven't already, go watch this video on youTube. I'll wait. Tonight I drew a heart on my arm, wiped off my mask, and took a photo to share on social media. I am one of the faces of mental illness. I live with Dissociative Identity Disorder, Borderline Personality Disorder... and all the extras that come with complex trauma. My mental illness sometimes incapacitates me to the point of disability. While my mask is off, I'm going to lay some of it out for you, because I'm not the only one. All around you people are going about their lives and statistics say that 1 in 4 of those people are living with mental illness -- and probably hiding it behind a mask. I split this into two halves, those of my conscious and un/sub conscious selves. Some things may seem to, or actually, contradict themselves, and these tend to be survival strategies and my brain approaching things things from weird angles that confuse everyone (including me). One example of this is that I am consciously not aware of things in my surroundings, while being hyper-vigilant about them. In that instance it's a case of "if I don't see what's going on, I don't have to decide what to do about it"; but the hyper-vigilance means that my body's ready to decide for me, should the need arise. I'm blind to the nuances of my surroundings; but overaware of the nuances of our conversation. If it is one way now, I will probably think it has always been that way. I probably will not notice that you shaved your head, got a tattoo, or pierced your nose. I will, however, stress for days over the tone of your voice when you said "goodbye". I experience severe depression. Sometimes I lose all motivation and it's a struggle to do anything. Sometimes I cry too easily and too often. Sometimes I have no tears at all. I have near-constant anxiety. Sometimes I experience panic attacks - some appearing out of nowhere, some due to known triggers. I self harm. You may have noticed that the skin on one of those hearts looks a little weird. That's because it's scarring -- a self inflicted wound five years ago resulted in a skin graft that covers approximately half of my forearm. I have massive problems with personal hygiene (and this is probably the thing I'm most sensitive about, in terms of admitting). Dental visits are rare and a big deal when they happen, and usually require hospitalisation afterwards for my own safety. My self esteem is nearly nonexistent. Some days it is better than others, but I don't think I'd ever rate it above 50%. I experience flashbacks and relive past experiences as though they're happening in the now. It can occur with partial memories or full memories. Sometimes when this is immersive, I can't tell that I'm experiencing a memory at all. I hallucinate. I see things that aren't really in the physical world around me. These things are generally benign and sometimes a little bizarre. Occasionally something I see will be frightening, such as when things that shouldn't move, do. I hear sounds and I hear the voice of a male who seems to be mid-30s (ish). When he appears, it is generally after a period of prolonged depression, and he tells me that God is telling me to die. Medication silences him. I also frequently hear things from the internal world. I experience this differently to my thought-voice, and to the aforementioned male voice. I think about suicide several times a day. I enter "actively suicidal" several times a year, and sometimes require hospitalisation to keep myself safe. I lack healthy boundaries. Sometimes I'm not sure where they should be, other times my self esteem stops me setting them where I objectively know they belong. I have terrible self care. I eat poorly, sleep poorly, and generally do little to look after myself. I am hyper-vigilant. I scan for exits every time I enter a space, and I note who and what is around me. I have an exit plan made before I take even two steps. I pick up on subtle emotions and body language cues that my conscious self doesn't know how to interpret. The un/sub conscious self interprets it as some form of threat (generally an emotional one; such as "you are upset with me"). I dissociate. Sometimes I 'switch' and another personality experiences the outer world, and sometimes I simply experience life through a fog. Sometimes, when things are particularly bad, I go into dissociative shut-down. When this occurs, it's as though my body is inhabited by a muted ghost. The lights are on, the door swings open at your touch... but nobody's home. In this state I could easily walk under a car without even registering its existence. On a related note, there is a team of insiders (alters) constantly monitoring what's going on, in order to ensure our physical safety as much as possible. This is exhausting, even with all of us helping out, and sometimes things fall apart because everyone's too tired to monitor effectively. I pick at my skin and pull out my hair when I'm distressed. My face and my chest are where I most pick (leading to people asking things like, "what's wrong with your face" & "do you have the chicken pox?") hair comes from my scalp when subsconscious, and legs when I'm consciously fulfilling this need. This is not a complete & exhaustive list. Neither of us has time for that. I hope, though, that it's given you a bit of an idea what lies behind the mask, and maybe given someone else the courage to speak up as well. This is not my story, it's just my symptoms. My story is made up of so much more than this; it's more than mental illness, it's even more than the sum of my parts. So this is not my story, these are simply some of my symptoms, and I'm not proud of my symptoms, but I'm trying not to be ashamed, either. Although the ways mental illness affects me might look different to the ways someone with heart disease, or lupus, or cystic fibrosis are affected by their illness, I have as little choice in my illness as they do. I didn't choose my mental illness, but every day I wake up and work to make my life better. I've been thinking of resurrecting this. I'm stil pondering, but in the meantime, have a poem written by a support worker at Connections. I've left his line breaks where they were, but I suspect that's mainly based on how much paper he had left on the page rather than where he intended them to be. refresher to my otherwise moldless life. He would love your feedback, if anyone's out there reading. Sometimes it seems like just when I start to find my feet and plant myself on solid ground, along comes something to shake things up. I'm still learning to be okay with that, even when the shake up happens for a good reason. I know it's been months. I hope nobody's been worried. This time, just as I reassured you all that I wasn't doing a disappearing act, I got unwell. And then my laptop up and died. And in the middle of all that, my world changed. After four years together, my relationship with Bumface is now over. I'm the one who ended it - but don't let that fool you. I took it hard. It's still hard, even though there have been other changes that have made things easier than I expected. There was no big fight, no earth-shattering revelation of betrayal that ended my relationship. Instead, it was a quiet dying of the intimacy we used to share, an insidious decay of time and meaning - but not the love. Never the love. And so I finally did what I've spent a great deal of time learning how to do - I walked away from a relationship that was hurting more than it was helping, even though I still deeply loved the other person. I still love him now. With my relationship officially over, I moved rapidly from "unwell" into "a serious risk". In addition, for some reason, the DID that had been fairly well managed for the last ten years suddenly became a major problem. It's still a problem, but things are beginning to settle down a little, at least. There are a lot of littles active again - both 'new' and ones I knew before; and although others are active as well, their ability to blend is better (as has been all along) and thus they are less noticable. I wound up with a friend staying for what was initially going to be a few days, but has lasted longer due to both the dissociation (and safety around that) as well as my state of self harm & suicide risk. I'd known this man for a little while, knew we had similar pasts and shared commonalities, but discovered more. Discovered, too, a man who had an instinctive grasp of what I needed; and an ability to provide it. We ended up deciding to explore a relationship together -- and we're still exploring. Now that we're past New Years, he's going to be going back to his own place (gradually), and I'll be living alone for the first time in my life. It's frightening and exhilirating all at once. It's been an interesting ride these last few months, but here's to a new year - new hopes, new changes, new starts. Hope you're all okay out there in the world. Stop in, say hi and let me know what's going on for you. I've missed you. I wrote this last year and shared it on my Australian BPD group. I came across it again today, and it seems like something that I should place here, as well. Although it's for 'the person with BPD', it may offer some small insight for those who don't have BPD as well. First of all, know you are not alone. There are men and women from all walks of life who can identify with those three letters, and though they may not always be people you would choose to have in your life, they are your allies and your kin. We walk these paths together; and as lonely as it can be, because of that we are never truly alone. Know that when you research your condition, you will come across websites that call you evil; you will come across websites that claim you are narcissistic and lacking in empathy. Know that being diagnosed with BPD does not equate to these things. Being diagnosed BPD means many things, but know that it does not make you a bad person. No website calling all people with BPD 'evil', 'manipulative' or 'narcisstic', or calling for extreme avoidance of all those diagnosed, is professional or accurate. Know that your future is not assured. BPD is, technically, incurable -- but it is not a life sentence. There is treatment available and life can get better. If you have done DBT and found it unhelpful, know that there is more than one option out there. There is no such thing as a one-size-fits-all treatment for BPD, no matter what anyone tells you. Know that your feelings, as strong as they are, will dissipate if you allow them to. Your anger will fade; your sorrow will ease. Nothing lasts forever, and your feelings are not the exception to the rule. You are the emotional equivalent of a third degree burn victim but you have the ability to graft yourself with thicker skin. You can get through this. Know that you can learn to control your behaviour. What you do in impulse now, you can learn to contain. Your angry outbursts, your uncontrolled spending, even your self harm can all become more controlled and can even be overcome entirely. It will take time and it will take a great deal of hard work, but it can be done. Know that the world is not as black and white as you'd like it to be, but you can learn to be okay with that. Know that your instinct to cast people or events into categories on the extremes can be worked with. You will learn, in time, that nobody is all good or all bad, and that is okay. Know that you will learn to know yourself, gradually. Maybe you will start with your favourite colour, or you will choose an animal to love. Maybe you will discover that you like your eggs scrambled, or you dislike jelly. Know that sometimes people will leave, but it doesn't mean that you are being abandoned. Life is full of change; people move on, or are taken from us suddenly. Not everyone was meant to be a permanent fixture in our lives; some people will stay for a heartbeat, others will fill our hearts for years. Know that you can learn to be okay with the changing landscapes of friendships and loved ones, despite the pain. Know, most of all, that there is hope. BPD is not a negative reflection on your personality and life can get better. Some of you may remember the old Sanguine Saturday posts I used to make. I decided to reinvent these as Sunday Sunshine, but with likely most of the same content. A weekly look at gratitudes, achievements and the like is probably something I need at the moment. Also giraffes, cats, guinea pigs, monkeys, dolphins, and other mammals. Also non mammals. Just animals in general, really. I walked from the street all the way into college all by myself. I've been brushing my teeth every day I've gone into college. I went out with friends -- this is a gratitude and an achievement because it was pretty scary, and there were some last minute changes that made my anxiety even worse. I knocked off another unit of study last week, which leaves me with one and a half (a prac and some related assignments that shouldn't take long) to finish before my next cluster opens on August 25. Even though I made a decision that didn't turn out very well, I was able to make better decisions in order to mitigate the negative effects. Don't forget to challenge yourself by posting up some gratitudes and achievements of your own, and send me the link. I can't wait to see them! Things have been busy here. I'm struggling to create a balance between study, home and social life. It's harder than I remember back when I was working -- but then again, it's more important to me to ensure my balance is healthy now than it was back then. I don't know how much I'm reclaiming of who I used to be. I think, instead, I'm butterflying into a new person. Hopefully, in time, I'll become a person with a better grasp of socialisation and emotion management, too. As I ease back into blogging, there are likely to be format changes. I've changed a lot since I started this blog (thank goodness), and my goals have changed. Something that hasn't changed is that I still want to use this blog as a place to help myself process things, and I also want to keep using it to help others. I don't know what that will mean for the blog at the moment, so please just bare with me in the interim. * Why am I struggling with my study? I've felt like I've really struggled with the last few units I've done. I don't know whether it's that my headspace isn't right (my depression has flared up in the last little while, and with it extreme amounts of anxiety -- plus I've had two recent deaths to grieve), the units are just getting harder, my way of learning isn't as practical with these units, or I'm just plain too stupid for this course. Most likely it's a combination of factors. Still, no matter what it is, I have no intention of quitting. I can do this. I will do this. Attend college 3-5 days each week as much as possible. Get help from tutors, peers and friends where needed. Monitor depression & anxiety - bring it up at next appointment with pdoc. Remember to actually use my Valium. All three in one because they're very interconnected for me. We all know these things have long been something I struggle with. Conflict (that isn't actually conflict) still leaves me torn up inside for months. I'm trying so hard to get better with this, but the unresolved emotions at the heart of it all are still very much holding me back. It's so bad it's actually become a real quality of life issue, and I don't want it to continue. I don't know what else I can do other than to keep going, keep trying, keep fighting, so I will do those things and keep experimenting to find new things. Watch friends and peers amongst themselves. Be aware of how conflict is handled between others -- use it as evidence of how those people will handle conflict with me (eg, if when in conflict with J, E walks off for a break, then finds J an hour later and they talk it out & their friendship remains strong -- use this as evidence E will not end friendship over small conflict). Keep on top of thought challenging -- "conflict is part of life, and most relationships don't fall apart based on conflict that is addressed", "I am allowed to be human, I am allowed to make mistakes". Those are the big ones I'm struggling with at the moment. As always, please feel free to throw suggestions at me for my own action plans. But... what about you? What's something going on in your life that you could develop an action plan for addressing? Feel free to blog and leave a link, or just answer in the comment section, and I'll see you tomorrow for some Sunday Sunshine.